What is the PowerCalf Mobile app? The PowerCalf Mobile app offers a new way to collect data chute side or when in the field. The mobile app uses a simple interface for data input on your Apple iOS or Android device. This data is backed up on the online portal which allows you to access and manage your data at anytime, anywhere. Has an offline mode so you can still use it where you do not have service. Cloud based which means you can not only back up your data but collaborate with others you work with. No limit on number of users per an account. Assign layers of roles and control access for members of your organization. Easily search all cowherd data in seconds. Option to use group and location management for real-time inventory report. Custom sort your data with our filters to create and export into excel or pdf. Compatible with Tru-Test Bluetooth EID scanners for easy chute side data collection. Free month trial upon sign up. $12 per month for the service. Need help getting started? We can import your cowherd so you can start collecting data right away. Having problems? Call our support line at 573-876-5262 or email bmcmullin@mfa-inc.com. We send a big thanks out to all the ranchers, cattlewomen and cattlemen who have helped bring this new app to the market and make it better. We believe it will help many ranchers improve their records and in turn, their herd quality. Check out the How-To Videos HERE. 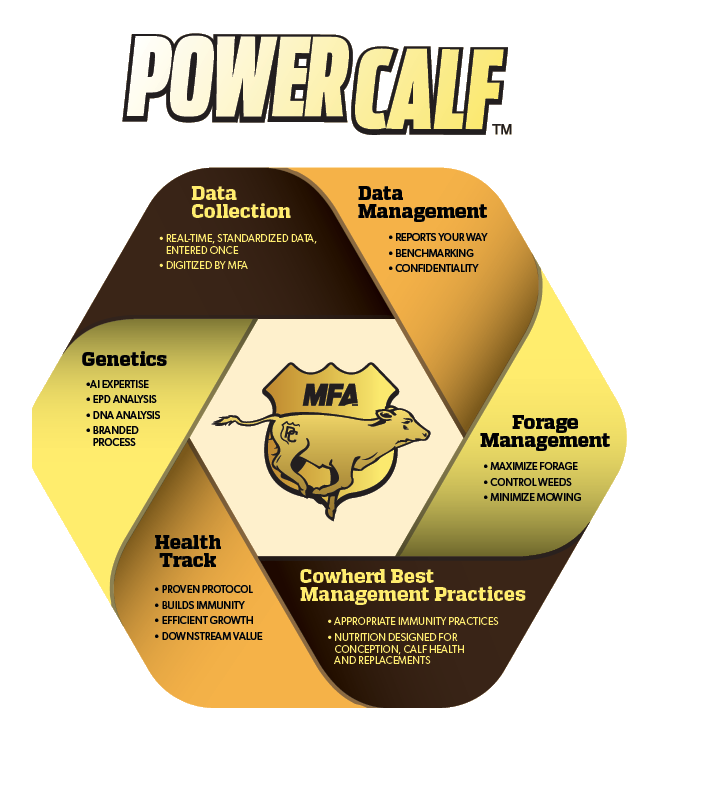 MFA Incorporated has launched the new PowerCalf Mobile App that helps customers capture herd data like never before. "Data collection, that's the only way you can prove what your cattle can do. " MFA PowerCalf is a strategy to empower beef cattle producers to improve their sustainability by providing the latest and most accurate data-enabled tools designed to maximize both the value of their genetics and their overall production. Meet production goals through PowerCalf Health and Nutrition. Grow and precondition calves on the cows. Record and collect essential data to help you be successful. Lock in profitability with standardized analysis tools. Largest profit for PC ever!